Not only is this the best dip recipe EVER but it only requires 3 ingredients. It doesn’t get any better than this! 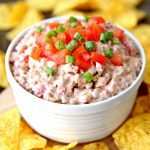 This Cream Cheese Sausage Dip is guaranteed to be a hit at any party and goes quickly so I recommend doubling the recipe or keeping it all for yourself. Cook sausage in large skillet over medium-high heat until sausage is crumbled and no longer pink, stirring occasionally; drain. Add cream cheese and Ro*Tel. Stir until well combined and cream cheese melts. Add sausage, cream cheese, and Ro*Tel to slow cooker. Cook on low. Stir dip every 30 minutes.